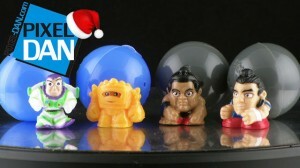 This is DAY 6 of the 2012 Toy Review Advent Calendar! Squinkies are everywhere! This popular line of mini figures has covered many different properties, including WWE and Toy Story! And now for the holiday season we get these special 2-figure Stocking Stuffer packs! Join me for a look at these holiday exclusive sets! As much as I like that they made WWE Squinkies and think they look pretty cool, I still wish they'd made them look more like the other sets. I still want to get them eventually, though.